If your business is solar energy then what better way to promote and demonstrate the competence of solar than by running an off-grid solar, battery, inverter-charger backup system to the AC grid. This is what Victron Energy dealers Enersoltec S.A. have done at their premises in Filadelfia, in Paraguay. Enersoltec’s system has been up and running for a year and a half now, allowing them to demonstrate to potential customers the opportunity of running their home or business totally off-grid. Continuity of AC electricity supply for their business is also important, as power cuts are not uncommon with their mains grid supply. 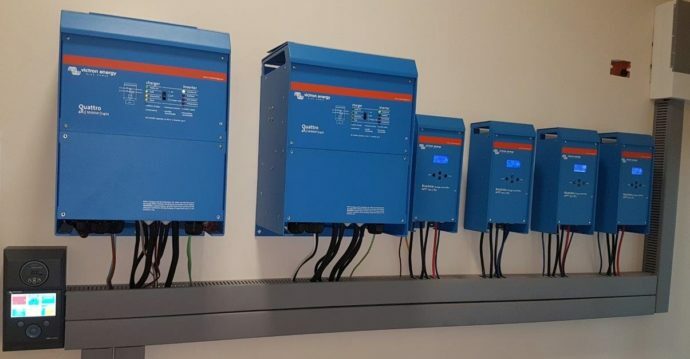 Power continuity and indeed the ability to be totally off-grid is now assured by using Victron Energy Quattro inverter-chargers and MPPT solar charge controllers. It took two days to install all 80 solar panels on the roof of their building and another three to get the system fully commissioned. 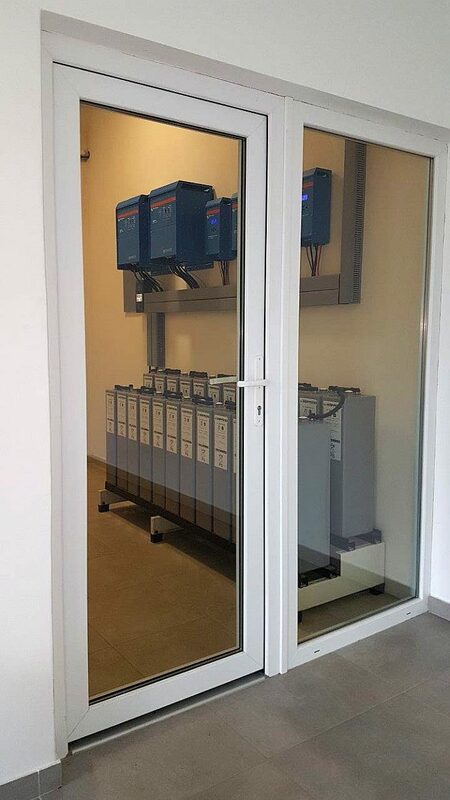 The power system is installed in a small cooled room and is monitored locally with a Color Control GX and remotely via the VRM. During the day Enersoltec run five Samsung air conditioning units at the same time, some machinery and low energy lighting. At night there are always two air conditioning units running. During the night the battery bank goes down to around 75% SOC, but fills up pretty quickly and is often back to 100% by 11:30AM. 2 x Victron 10kVA Quattro Inverter-Chargers. 1 x Victron Color Control GX. 1 x Victron BMV-700 series battery monitor. 80 x 270Wp solar panels, giving 21.6kWp in total. 24 x OPzV 2V/900Ah cells in series, giving a 48V/900Ah bank. As a Victron dealer, Enersoltec are delighted their business premises are totally off-grid now, with power cuts being a thing of the past – and what better way to demonstrate Victron Energy products than that! Thanks to David Martens and Boris Balzer of Enersoltec S.A. for the information and images used in this blog. CLAFIS Victron Energy Solar Boat Team - making waves?